Gotta hand it to Maxine Waters, the California Congresswoman has never met a Republican she didn’t hate or a corrupt liberal movement she didn’t love, but that doesn’t stop her from spewing her venom in public. Ms. Waters has been feasting on her hatred of Donald Trump ever since he won the election, saying she would never meet with or work with the new president, and going even further calling for his impeachment. 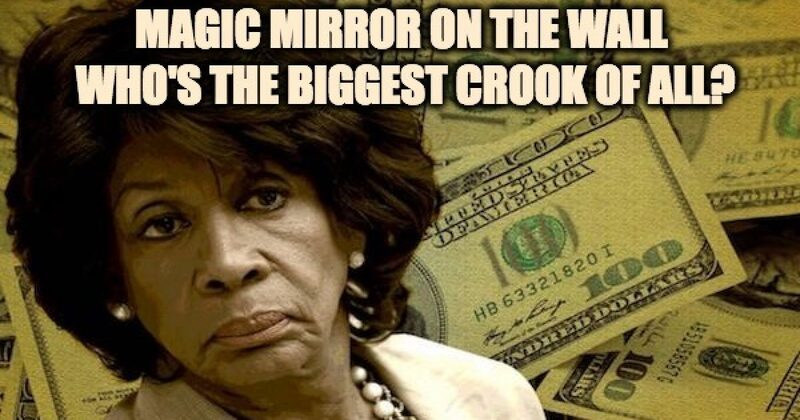 In her latest tirade, Maxine Waters spews that President Trump cannot be trusted, an ironic angle for a woman who has enriched her family on the public dime. In a tweet issued Friday, Maxine Waters, the California Democrat obsessed with Trump-Russia conspiracy theories and impeachment, declared on Twitter that First Lady Melania Trump can’t trust her husband. Many who read her tweets, threw her claim right back at her. “Democrats can’t trust Trump, Republicans can’t trust Trump, and Melania can’t trust Trump,” she said, offering no proof for her unhinged claim. Waters, a frequent critic of Trump, ramped up her attacks on the president following his meeting with Senate Minority Leader Chuck Schumer (D-NY) and House Minority Leader Nancy Pelosi (D-CA) to discuss the potential legalization of DACA recipients and improvements in border security. Trump quickly tweeted that he did not reach a deal on DACA with the two Democrat leaders but hinted at making a deal that would possibly give amnesty to illegal aliens. Waters did not elaborate on her attack of the First Lady but could have been alluding to a Vanity Fair piece that tried to paint Melania as someone who is unhappy with the increased amount of scrutiny her marriage is getting now that Trump is president. Other media outlets have been quick to judge that Melania’s non-verbal body language towards her husband is a sign that she does not trust him, without any basis in fact. Right, corrupt waters. And democrats shouldn’t trust you. Zip it, hypocrite. You’re attempts at being clever are worn out and predictable. Then again, your Marxist ideology frowns on individual innovation, doesn’t it? And Maxine Waters is the paragon of trustworthiness?!?!?!? Keep in mind this is the same Maxine Waters who questioned the patriotism of Trump supporters on the floor of the House of Representatives and who has yet to condemn threats to murder the president. How much money have you taken so far? In the end, Maxine Waters avoided the ethics charges by getting her Grandson and Chief of Staff, Mikael Moore to take the fall. Grandchild Moore got off with a “letter of reproval.” Waters got off despite the fact that she requested the bank bailout money for a bank where her husband owned stock and had served on the board of directors.” At the time she requested the help, Waters neglected to tell Treasury officials about her financial ties to OneUnited Bank. I bet her grandson got a nice gift for Christmas that year. Now tell me, who shall we trust?